It's time to close the net on fishing "pirates" who threaten to undermine vital marine ecosystems, says Karen Sack. In this week's Green Room, she highlights the scale of the problem of illegal fishing and calls on the international community to act. Tales of pirates have filled countless books and films for generations. Today, modern tales of piracy off the coast of East Africa have captured the world's attention. Yet, there's another form of piracy on the high seas - fish pirates, who are stealing the wealth of life out of the oceans. And the international community ignores this problem at the peril of the billions of people who depend on healthy marine ecosystems for both food and their livelihoods. According to the UN, the total value of world fish exports was US $102bn (£70bn) in 2008 alone. More than half of all fish caught worldwide is traded internationally, with most being caught in the waters of developing countries or on the high seas but sold to markets in Europe, North America, Japan or China. 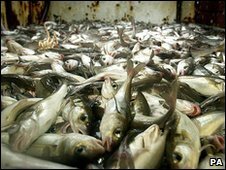 As a result of collapsing fish populations, some scientists have estimated that industrial-scale commercial fishing may be a thing of the past by 2048. Illegal, unreported and unregulated (IUU) or "pirate" fishing is a lucrative practice which compounds the problem of overfishing. Worth as much as $23.5bn (£16.1bn), IUU fishing takes an estimated 11 to 26 million tonnes of fish from our oceans annually, roughly equivalent to about one-fifth of the global reported total marine fish catch. But this practice does not take place entirely below the international community's radar. Indeed, in the EU there are documented cases of vessels which have benefitted from public subsidies later being found guilty of fisheries infringements. Recently, the UN convened a special week-long conference to discuss the state of fisheries management on the high seas. Included on the agenda was a look at the implementation of the 1995 UN Fish Stocks Agreement and the efforts of Regional Fisheries Management Organisations (RFMOs) to combat the threats facing global fish populations. In order to focus the attention of world leaders on the threat of IUU fishing, the Pew Environment Group presented the results of a recently published study in the journal Science at the conference. The research illustrated how gaps in current international fisheries management and the failure to tackle IUU fishing are undermining the health of marine life in our oceans. Based on publicly accessible data, the report examined port visits by vessels recognised and listed by RFMOs as having engaged in IUU fishing. Researchers, though, could only track port visits by one-third of the vessels on the IUU lists. The study also found that the states where IUU vessels enter ports only properly fulfilled their international obligations to control these vessels in one out of every four cases. This is a trend that cannot continue. For the international community to make significant progress in the fight against IUU fishing, we must close the current loopholes that allow vessels to fish illegally without strong reporting requirements or accountability. We also have to stop further public funding of known malefactors - including numerous subsidised vessels recently identified by the website Fishsubsidy.org. To start, three key steps must be taken. First, all vessels capable of fishing in the international waters of the high seas should have a unique vessel identification number from the International Maritime Organization (IMO). These numbers are required for all commercial shipping vessels, but fishing vessels have been exempted. 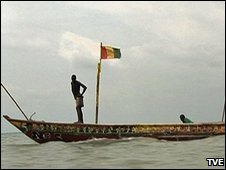 Without a unique IMO number, illegal vessels can disguise themselves by altering their names, or changing the flag of the country they are registered to, and evade detection by already overstretched authorities in many countries. Second, countries must quickly ratify and then enforce the new UN Port State Measures Agreement which, for the first time, creates an obligation on governments to refuse port access to vessels suspected or known to have been involved in IUU fishing. This would close down the avenues to pirate-caught fish, and make it much more expensive for those trying to flout international rules and regulations. Third, governments need to establish an electronic global register of IUU fishing vessels - just like an international watch list. 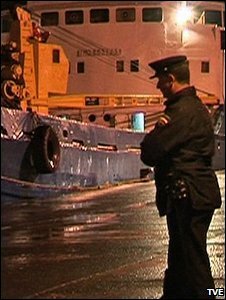 This "one-stop" information shop would enable authorities to make informed decisions on whether to allow them into port. IUU fishing undermines the livelihoods of coastal communities and global food security, as well as the conservation of the world's marine resources. Ending it will by no means be an easy task, but it is time for the world community to address the problem with the seriousness it deserves. Governments should take strong, meaningful action - at home, through Regional Fisheries Management Organizations and at the UN -- if this pirate tale is to have a happy ending. Do you agree with Karen Sack? Are the actions of fishing "pirates" threatening to undermine vital marine ecosystems? Is the international community doing enough to halt IUU fishing? Or is it impossible to effectively police the high seas and halt illegally caught fish being landed? No doubt that we definitely need a sound ocean management and administration. Three key steps suggested by Ms Karen Sack -vessel identification number from IMO, ratification & enforcement of UN port state agreement and establishment of electronic global register are quite necessary to streamline the ocean environment. The new mechanism would help the international community immensely to restrict indiscriminate and wasteful fishing and also to resolve various other ocean related issues. I agree. Enforcement of international regulations (of all kinds) in international waters is a big problem. Illegal trawlers can be seen 24 hours a day within 1 kilometer of Liberia's shores. They fish so close to shore that individual Liberians in dugout canoes are sometimes further out to sea. By all accounts they are decimating fishing stocks and causing locals to risk longer and further voyages in search of their livelihoods. A few coast guard vessels would go a long way towards a solution. Not only do "pirates" who overfish. or fish from the wrong areas cuase damage, but "apparently" legitimate fishing has led to what is more commonly considered piracy. As the Somali fisherman have found, a high tech ocean going fishing boat can clean up in short order all the fish that they rely on, destroying their livelihood. These fisherman can either starve or use their fishing boats for other forms of profit as we have seen in the increased piracy off East Africa. While I don't shed too many tears for these Pirates, any punishment the are due should also be meted out to the fishing fleets that prey on both fish and local economies. Besides,life in the world's estuaries, coastal waters, enclosed seas and oceans is increasingly threatened by: 1) overexploitation of species, 2) physical alteration of ecosystems, 3) pollution, 4) introduction of alien species, and 5) global atmospheric change. Here in Gibraltar we are regularly invaded by Spanish fishermen, who break Gibraltar's wildlife protection laws with impunity and under the protection of Spain's paramilitary forces (Guardia Civil). Outgunned and with smaller vessels, our own police does little but look on, as the tame, Foreign Office controlled Royal Navy stay inside the harbour conducting 'man overboard' drills. Nelson would roll in his barrel if he saw what was going on!